If you like hot regency romances, then this book is for you. I just adored it from start to finish. 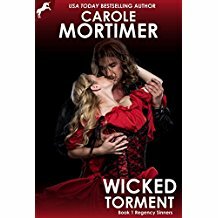 This is the first book in Carole's new series and it is certainly WICKED and VERY VERY HOT. These are a group of eight men who have been orphaned and came together when they were at school and have remained friends ever since. I won't be talking about the story but the characters, because otherwise they would be a lot of spoilers. Lady Beatrix Hanwell, or Bea. Is a widow who had a very unhappy marriage, she was married when she was young and her husband was a lot older than herself and he was violent towards her leaving her with scars on her back. Bea doesn't have any experience when it comes to making love. Well lets put it this way she soon does. Her staff are very loyal and they and Bea have a secret. (All will be revealed). Darius Strong The Duke of Wolferton or Wolf. Well what can I tell you about Darius he is gorgeous, muscular in all the right places, he always wears black shirts with black cravats and he certainly fills a pair of breeches and he also has long hair. (Not keen on long hair but I can forgive him for that). He is a man that once he sees something that he wants he goes and gets it, and he wants Bea. But underneath all that muscular manliness he wants love and he hopes to get that with Bea. (Except for the secret). Also because Darius is very particular how he dresses he has to dress a certain way for dinner which he isn't happy about. They're is also a great relationship with Darius and his valet Quinlan, he is funny, he has been with Darius for a number of years and is very loyal to him and he is also honest with Darius. Quinlan falls in love with Bea's butler. (and is also is helping Darius with the secret). For me this book was a fantastic read and may not be everybody's cup of tea. I would give this book 5/5, for me this comes highly recommended. I am so looking forward to the next book in the series which is: Wicked Surrender Regency Sinners 2, this is were we meet Dante St Just, The Duke of Huntley. Can't wait to meet him. This book is released on 30 June.